New attorneys were admitted to practice in Illinois on May 10, with Illinois Supreme Court and Illinois Appellate Court justices presiding and administering the attorney's oath to 401 new attorneys at five separate locations across the state. All of the candidates passed the Illinois State Bar Examination and a required ethics examination and were certified by the Supreme Court Committee on Character and Fitness. They bring the total number of licensed attorneys in Illinois to approximately 96,500. The largest group, 275, was admitted in the First Judicial District during three ceremonies at the James R. Thompson Center Assembly Hall, located at 100 W. Randolph St., in Chicago. Illinois Supreme Court Justice Anne M. Burke presided over the first ceremony, Illinois Appellate Justice Cynthia Y. Cobbs presided over the second ceremony, and Illinois Supreme Court Justice Mary Jane Theis presided over the last ceremony. The ISBA Board of Governors met on May 11 at ISBA Headquarters, 424 S. 2nd St., in Springfield. Arthur F. "Art" Powers, Jr, 78, of Decatur, passed away Friday, April 20, 2018, in Sullivan Rehabilitation and Health Care Center, Sullivan, IL. Art was born October 18, 1939, the son of Arthur F. and Opal Imogene (Clemons) Powers. A U.S. Navy veteran and member of Ss. James and Patrick Parish, Judge Powers served his country proudly aboard the U.S.S. Saratoga. He liked flying, fishing and spending time with his grandchildren. Art married Carolyn J. Edwards August 17, 1968, in Centralia. W. Loren Thomson, 86, of Bloomington, died Friday, April 13, 2018, at Sugar Creek Assisted Living Center under hospice care of VITAS. Loren was born July 6, 1931, in Bloomington, the son of James L. and Virginia M. (Johnson) Thomson. Loren married Judith Johnston on Dec. 26, 1974, in Greeley, Colo.
Kenneth "Gary" Kombrink, 72, died Sunday, March 25, 2018, at his home in Bloomington after being treated for lymphoma at the University of Chicago for the past 6 months. He was born August 29, 1945 in Harrisburg, Pa. He attended high school in Belleville, Ill., and college at the University of Missouri, where he was quarterback of the football team from 1966 to 1967 and co-captain his senior year. After graduation in 1968, he served in the U.S. Army as a second lieutenant from 1968 to 1970. New attorneys will be admitted to practice in Illinois on Thursday, May 10, with Illinois Supreme Court and Illinois Appellate Court justices presiding and administering the attorney's oath to 401 new attorneys at five separate locations across the state. All of the candidates set to be sworn in have passed the Illinois State Bar Examination and a required ethics examination and were certified by the Supreme Court Committee on Character and Fitness. They will bring the total number of licensed attorneys in Illinois to approximately 96,500. The largest group, 275, will be admitted in the First Judicial District during three ceremonies at the James R. Thompson Center Assembly Hall, located at 100 W. Randolph St., in Chicago. The ceremonies will be at 9 a.m., 11:30 a.m., and 2:30 p.m. Illinois Supreme Court Justice Anne M. Burke will preside over the 9 a.m. ceremony, Illinois Appellate Justice Cynthia Y. Cobbs will preside over the 11:30 a.m. ceremony, and Illinois Supreme Court Justice Mary Jane Theis will preside over the 2:30 p.m. ceremony. The United States Attorney's Office (USAO), Central District of Illinois is seeking an experienced attorney to serve in the Civil Division. The USAO is responsible for representing the federal government in litigation involving the United States in the Central District of Illinois, which includes criminal prosecutions for violations of federal law, civil lawsuits by and against the federal government, and actions to collect judgments and restitution on behalf of victims and taxpayers. The Civil Division handles a variety of cases including affirmative litigation to recover public funds which have been wrongfully obtained by fraud, civil rights enforcement, defensive matters involving government agencies and employees, asset forfeiture, and collections. This position is located in Springfield, Illinois. Land of Lincoln Legal Assistance Foundation, a non-profit organization which provides free legal services to eligible individuals in central and southern Illinois, is looking to hire a staff attorney at its Northern Regional Office in Springfield. Responsibilities for this position include representation of low-income persons in routine and complex civil litigation, including, but not limited to, family, landlord-tenant, and consumer cases. Participation in community legal education and outreach. To qualify, applicants must be admitted to the Illinois Bar and demonstrated commitment to the representation of low-income individuals. Prior legal services or clinical work experience strongly preferred. The Illinois Judges Foundation and the Illinois Bar Foundation will honor retired Justice Philip J. Rarick, Hon. Carole K. Bellows, and attorney Harvey B. Stephens for their exemplary careers and dedication to advancing the legal profession on Tuesday, May 15, at the Legal Luminary Reception at the Illinois State Library in Springfield, Ill. 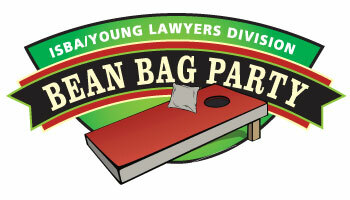 Please join us at the ISBA Young Lawyers Division Bean Bag Tournament on Saturday, May 12 to show off your bean bag tossing skills. Groups will compete for first place in this annual tournament. Interested participants can register as a team or individually to be paired with another YLD member. We hope you help us continue this tradition of giving by joining us this year at our new location, the Firefighters Lake Club in Springfield.